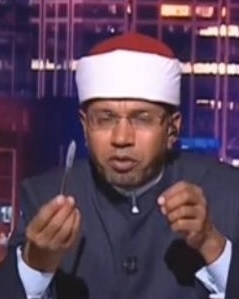 Egyptian Cleric Mahmoud Al-Denaw, seen off to the right in the festive red and white hat, caused a little bit of a stir recently with an appearance on an English-language call-in show aimed at Muslims living in Europe and Africa. During the broadcast a caller asked how to discipline a disobedient wife, and Dr. Al-Denaw caught heat for providing completely reasonable and accurate advice. His suggestion was never to hit her in the face because the face belongs to Allah – even though you totally could so long as you made her wear a burka and didn’t give her a black eye. Instead, you should admonish her and explain the error of her ways. If she didn’t improve, then, and only then, should you beat her with something small like a pen. The only real downside to this good advice is American and European women aren’t as docile as Muslim brides, and I’m not sure you want to hit them. I’m also fairly certain my wife has put rat poison in my food at least once just for writing bad things about her on this site. Thankfully, thousands of years of terrible Codajoy parenting have rendered me immune to most poisons, and as long as I don’t pass out drunk in the driveway, she won’t “accidentally” almost back over me again.